On February 15, 2011, Chase Alumni Austria held its luncheon at the St. Johann´s Club with 10 Alumni attending: Armin Dallmann, Rudi von Geymüller, Alexander Götzinger, Erhard Grossnig, Günter Korp, Heinz Ratka, Willi Rosenfeld, Maria Steiner, Edith Fischer and Wolfgang Fenkart-Fröschl. Maria Steiner gave a presentation on Bankhaus Schelhammer and Schattera, Vienna´s oldest private bank, which was founded in 1832 and is today majority owned by the Roman Catholic Church. 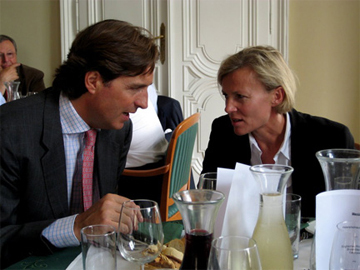 Besides Maria Steiner, who is in charge of the bank's Risk Management, Peter Böhler, also a Chase alum, is Managing Director at the Bank. Unfortunately he could not attend due to an unexpected last minute meeting. As a result of its very conservative policicies, the Bank survived the economc crisis relatively well and continues its solid growth with focus on ethic values. We would like to thank Maria for her interesting presentation. At our next Luncheon, Helmut Breit will give an update on the Raiffeisen Group and we hope to have Eberhard Winkelbauer and Heinz Sernetz join him on the presentation.